I heard a radio interview this week with Jane Elliott of the brown-eye-blue-eye experiment fame, and she suggested that racism is still an issue in the USA (through the efforts of a vocal minority) and is best demonstrated by the determination in certain quarters that Barack Obama will not win a second term*. 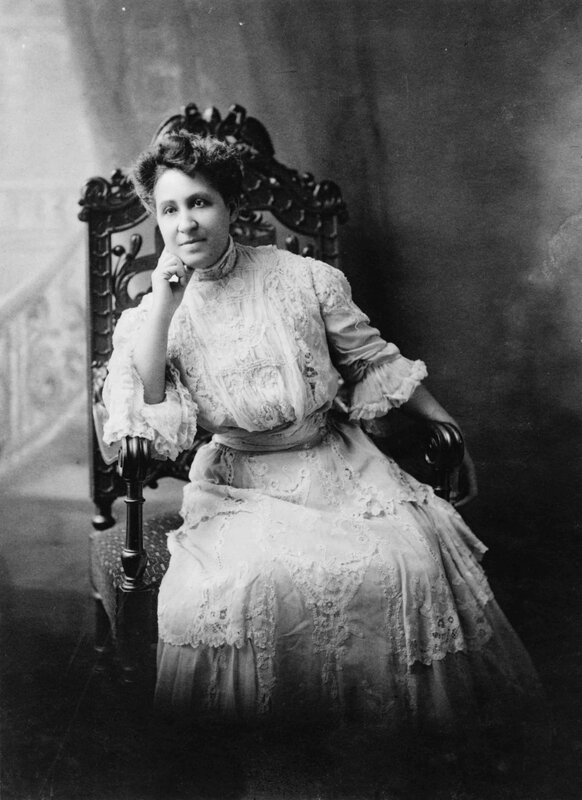 It’s therefore apposite (perhaps) that my first Library of America post this year be on last week’s offering, “What it means to be colored in the capital of the United States” by Mary Church Terrell (1863-1954). This essay originated, according to LOA’s introductory notes, in a talk Terrell gave at a Washington women’s club in 1906. It was then published anonymously, LOA says, in The Independent, in 1907. Now, I’d never heard of Terrell, but she sounds like one amazing woman. Not only did she live an impressive-for-the-times long life, but she had significant achievements, including being, it is believed, the first black woman to be appointed to a Board of Education (in 1895). She also helped found the National Association of Colored Women. On a slightly different tack, she was a long-time friend of H.G. Wells. Interesting woman, eh? I have a few reasons for being interested in this essay, besides Jane Elliott’s comment. I lived in the DC area – in Northern Virginia – for two years in the early-mid 1980s and was surprised by some of my own experiences regarding race there. And, as a teen in the 1960s and early 1970s, I was aware of and fascinated by the Civil Rights movement in the USA. I was surprised but thrilled to hear, late last year, an audio version of John Howard Griffin‘s book, Black like me, that I read and loved back in those days. The irony here is not subtle – but she’s in the business of education where subtlety would not get her far! … and I felt that it was particularly cruel, unnatural and cold-blooded for the representative of one oppressed and persecuted race to deal so harshly and unjustly with a member of another. You can guess why, in 1907, this was published anonymously! … surely nowhere in the world do oppression and persecution based solely on the color of the skin appear more hateful and hideous than in the capital of the United States, because the chasm between the principles upon which this Government was founded, in which it still professes to believe, and those which are daily practiced under the protection of the flag, yawns so wide and deep. Some 100 or so years later, the US sees itself as the leader of the free world and yet it seems that this chasm is still rather wide. What are the chances that it will completely close one day? * Please note that this is not a holier-than-thou post. We Aussies have our own problems with racism and prejudice, and so I am not about to throw stones at anyone else. I was raised to be color blind in New England and the Midwest of the US. When I met my husband, whose family is from Virginia and Maryland, we went to visit a few times. I was amazed at the casual racism still rampant in parts of this country – I can’t believe how ignorant I was to it all. Have Barack Obama as president has been another eye-opening experience; I am amazed, and occasionally dismayed, at how people I thought I knew well have reacted. Reactions that have NOTHING to do with political opinions. This essay sounds fascinating. I’ll have to check it out. Thanks PCB for sharing this. My experience in Northern Virginia in the 80s opened my eyes to how much racism still exists among people I had assumed (because like you I thought I knew them and their world view) would be different. We invited a black American to our home and the shocked response and discomfort among many (not all thank goodness) of those present (American and Australian) truly surprised me. He was an intern at an arts organisation where I was volunteering. It seemed the most natural thing to do to me – to invite him – but clearly that wasn’t the norm. I think you’ll still find problems to do with race inherent in most societies even if they’re not enshrined in the laws of the land concerned. I could take you to housing estates not more than a couple of miles from here where a black person would walk in fear of their well-being if not exactly their life. Equally, there are parts of the city where I, as a white woman, know I would not feel safe. However hard we try to overcome these issues there always seems to be more progress that we need to make. Well said Annie. When I wrote my little footnote, I thought of England too – of what I know from the news. “The Bill” (ha! ), and novels like “White teeth” and “Small island”. It’s pretty endemic isn’t it? It’s useful to look back every now and then to see we’ve come from, but we sure can’t rest on our laurels. What an interesting essay and a fascinating woman. Sadly racism continues to hang around. One of the things that makes me bonkers is that some of those people in certain quarters who don’t want Obama to be elected to a second term accuse him of being racist! Oh yes, I’ve heard that too … people can twist anything to suit their own world view (or their propagandist purposes) if they want to, can’t they? Had you heard of Terrell? I’m just wondering whether she’s well known over there? I suspect not because it sounds like much of her work was organisational rather than out the front? Thanks for answering Stefanie. Most of the LOA offerings are by familiar names to me but this was one of the ones that wasn’t, so I was intrigued to know. I guess vigilance is the key … isn’t it. attitudes. Some members of other races are frequently as guilty as we are . I believe the answer lies in ‘you in your small corner and me in mine’ showing respect, defending where necessary, and definitely ‘giving a leg up’ to those of other nations or races in need. Governments can’t legislate – only people can change attitudes (our own and if possible, by example, other people’s). I agree that we’re not … but the issue is that the white races tend to be the ones in power and so the racism perpetrated by us tends to have far greater ramifications, and may even set the tone. Governments do legislate, don’t they?, but that only enshrines legal rights. It doesn’t necessarily change attitudes (as you say). Sorry, I meant governments can’t change attitudes by legislation. Certainly, as you say, they can enshrine legal rights but it is people’s attitudes that have to change and only when the biggest majority change will racism cease to exist – I wonder if it will ever happen. Thanks for the clarification LL … as for if it will ever happen, the older I get, the less likely I think it will. The cynicism of age? This essay has me thinking. I haven’t had time to absorb it all. I live in the Deep South (in New Orleans). I’ve heard about black people discriminating against other black people for being too dark and not passing the paper bag test (if your skin is darker than the paper bag from the grocery store, then you are too black). The Jewish people in New Orleans fought for the civil rights of blacks when other white people wouldn’t do so in the 1960s. Pres. Obama is not considered a true African-American by some people. The African-American is reserved for black people whose ancestors were slaves. Since the President’s father was from Africa and the family wasn’t enslaved in the US two centuries ago, then he is not truly African-American. I have more thoughts. I will write them down in my blog and let you know when I publish them.